It's down to the wire and you have ten people coming to your house in just four days. Now you've gotten three texts asking you what they should bring. You stop cold and don't have a good answer. You haven't even come up with a menu yet. With promises to get back to them ASAP, you get out your laptop and begin to pore over endless recipes on Pinterest. You end up with a great board with lovely-looking Thanksgiving dishes, but then you remember your budget. You only have $50 to spare for this event and from what you can tell, that is NOT going to cover it. Don't worry! I've got you covered. Here are some great ideas for a Thanksgiving that won't break the bank. First things first. Get out pen and paper and start your list. You'll need appetizers, drinks, a turkey, side dishes, stuffing, bread, dessert, coffee and tea. That's not too bad. You've got this. Now, get online or pull out your latest grocery ads to see what you can grab for a good price without sacrificing homemade quality. You notice turkeys are on sale at the local grocery store. The generic brands are only 49 cents a pound. This is going to be your biggest purchase and you are super excited to grab this deal. You even make a mental note to come back next week to see if there are any left to stock your freezer. This week there is a one-bird limit, so a second turkey for storage isn't even an option even if budget did allow. With a guest list of 10 and lots of other items on the menu, you opt for a 20 pound bird, thinking this will cover you just fine. At 49 cents a pound you are only set back around $10. Next you think about appetizers. Cheese and crackers are a good options, but even though you are on a budget, you want to make this a dinner to remember. You decide to ask Johnny to bring a cheese and cracker plate (you quickly text him while you are thinking of it) and you will make spinach bread. At $1 a loaf, italian bread is a steal. You pick up cream cheese for $1.50, creamed spinach for another $1.50 and you lastly grab a block of Monterey Jack on sale for $2. $6 for an appetizer. Not bad. Next you grab some good coffee. It's $5 a bag, but cheap coffee is just gross. Half and half is on sale for $1. You already have tea in the cabinet. Hot drinks covered, $6. Stuffing. You notice boxed stuffing is on sale for $1 a box. This a great deal and you stand in the aisle hemming and hawing over it. In the end you decide that to be a truly great homemade Thanksgiving you'll have to forego the boxed stuff. You head to the bread aisle and grab 2 loaves of cheap white bread for $2. Then in a the produce aisle you grab a bunch of celery and an onion, both on sale for $1 a pack. You're golden. Butter is another $3, but you'd never go for the fake stuff. Stuffing, $8. Now you think about side dishes. Green beans and potatoes. Both on sale, these set you back $4. Not a bad deal. Your plan, classic mashed potatoes and lightly sautéed green beans. You feel accomplished and head over to the checkout line. Then you stop and realize Angela also wanted to share a dish. You grab your phone and send a text asking her to bring a vegetable. You let her know you plan on green beans and mashed potatoes and suggest she bring sweet potatoes or a winter squash knowing both will fit the menu perfectly. Now cranberry sauce is a must for Thanksgiving. You already have the sugar in your cart and you scoot back over to the produce aisle to grab a bag of whole cranberries. Homemade cranberry sauce is so easy to make and so much better than canned. You throw them in the cart and try to remember what's next. The rolls. With the other ingredients you bought for the pie you should have the ingredients list covered. You stop for a minute, check your list and realize you have everything. Awesome! Tip! If your cupboards are not bare, take inventory of your shelves! Many people have crisco, flour, sugar, canned pumpkin and milk on hand. If you have onion powder, you can sub that where onions are used. If you have bread ends in your freezer, those make a great stuffing. Dry or evaporated milk can be used in place of fresh. Tip! 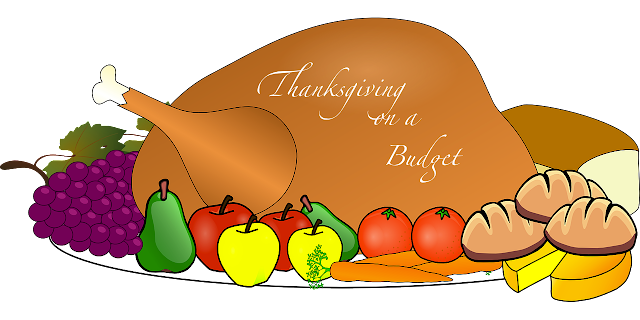 Think about your next year's Thanksgiving feast months in advance and collect items as they go on sale. Butter goes on sale for $2-$2.50 around holiday time and can be refrigerated for long periods of time, or frozen even longer. Combine that with coupons that come out this time of year and you've got yourself a deal! Tip! If you've been frugal and have an extra $10, grab an extra turkey. They can last over a year in the freezer. Trust me, I've done it. They are great around easter time when you're planning your next feast!